I can't never forget the feel first time I read an article about Joe's guitar setup. That was back in the end of the '90s. Lucky, that page is still available here. Action on Joe's guitars is so low that at first I thought it was typo in the article. It stated that action is about 2/64" (0.8mm). At some time I got very attracted to play Joe's music so I bought cheap Ibanez Gio guitar (I badly needed guitar with floating tremolo system but I was short on money). I must admit that Gio guitar was best bang for buck. Zoran and I immediately perform all the activities needed to make that guitar comfortable. 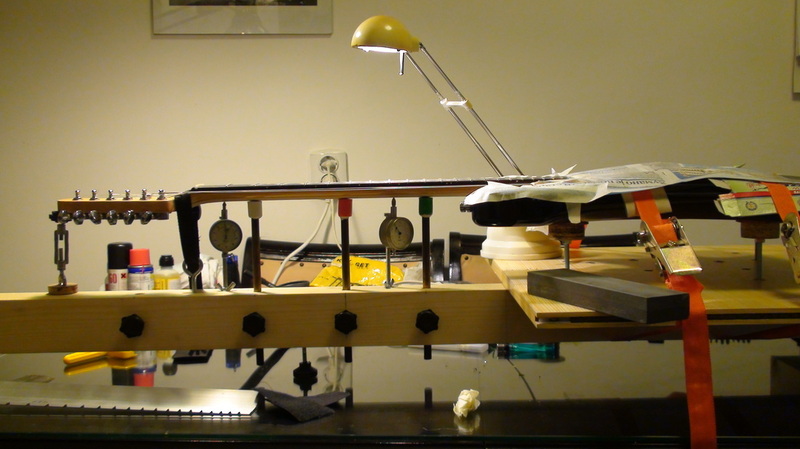 No matter how I setup the truss rod, some of the frets were buzzing. During one sleepless night, I took the fine sandpaper and little by little (in very small sand-try-sand steps) sanded out the frets that was culprits for string buzz. It took me all night to perform such a delicate action. Next day I made an action as low as possible. Guitar was playing all along the neck very clean, without single fret buzz. I took a caliper and measured action of 0.7mm below first string at 12th fret. WOW!!! As an engineer, I had to find a reason what is cause of that fret buzzing problem. When I do fret dressing I make a neck perfectly straight but latter when the string are back on and tuned to pitch, neck is not straight again, I got that awful fret rise at 12-15 frets. Something happened with the neck under string tension. On the net I found an article-commercial about Dan Erlewine's Neck Jig. I thought to myself "This is easy and cheap to make, I'll give it a try". More about Neck Jig you can find here (this is much advance version than earlier wooden model I replicated). When I finished my neck jig clone, I need a guitar for testing purpose. Luckily, I got another Ibanez Gio guitar similar to previous one I have had. I followed all the steps Dan Erlewine wrote in the original neck jig user manual (thanks Dan) and voila - guitar was playing very nice with low action w/o fret buzz.